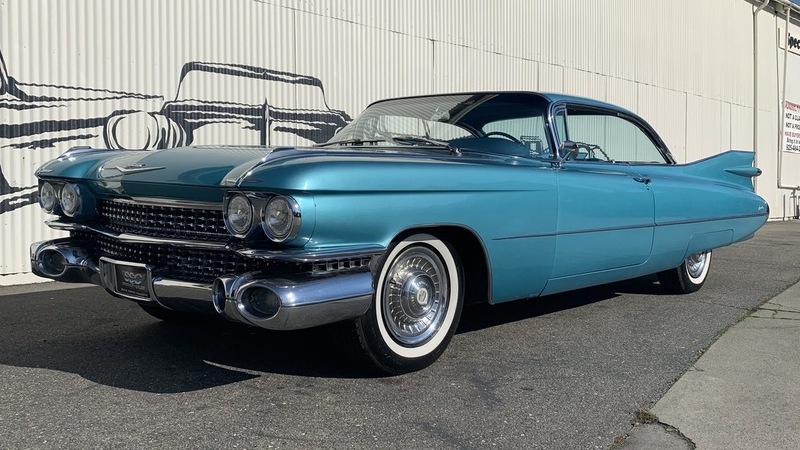 Allmän beskrivning : This 1959 Cadillac Coupe Deville 2 Door Coupe (Stock # P10501) is available in our Pleasanton, CA showroom and any inquiries may be directed to us at 925-484-2262 or by email at Sales@SpecialtySales.com. New to our Pleasanton showroom is this eye-catching 1959 Cadillac Coupe Deville 2 Door Coupe with turquoise blue exterior paint and a matching blue/black cloth interior. You’ll find a factory correct 390 cid V-8 engine under the hood with a matching automatic transmission and this beautiful, iconic classic vehicle is very nicely equipped with upgraded 4-wheel power disc brakes, power steering, power door locks, and countless original trim pieces and accessories. 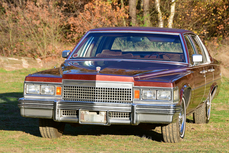 This example is in very nice original condition and it is a true joy to drive. This 1959 Cadillac Coupe Deville originally sold in Santa Rosa, California and it has remained on the West Coast virtually its entire life. The current owner took possession in 2017. 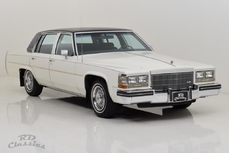 You will find very nice original chrome with only minor pitting and factory glass as well, plus several factory trim pieces to the dash, door panels and along the exterior. Most would consider this example a high end driver with lots of upside- it’s ready to be enjoyed right away by the next owner and definitely clean enough to show locally. Additionally, this 1959 Cadillac Coupe Deville Coupe has a nice feel on the open road with nice acceleration and very smooth handling. 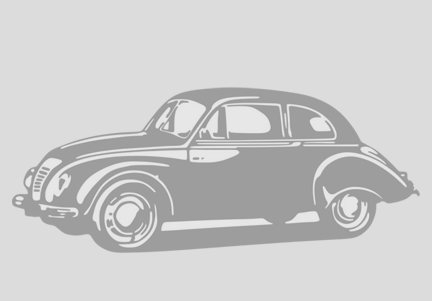 The four wheel disc brakes are a welcomed upgrade as well since this classic stops on a dime. From what we can see, it appears that this example has been kept largely factory stock throughout its lifetime and the overall quality really stands out in person. Overall, this 1959 Cadillac Coupe Deville 2 Door Coupe is a high end classic driver with nice curb appeal and excellent performance. It doesn’t need anything to be enjoyed right away and it’s a great value at the current asking price. 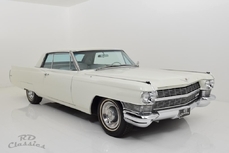 Given how desirable these ‘59 classics are with the large fins, you’ll be hard pressed to find a more impressive model within this price range. For more information about this vehicle, visit our Pleasanton, California showroom, give us a call at 925-484-2262, or email us at Sales@SpecialtySales.com. Be sure to mention Stock # as well. 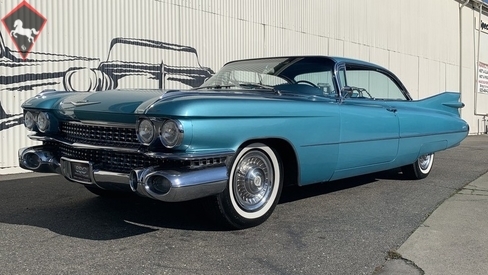 1959 Cadillac De Ville 8 cylinders 390 is listed såld on ClassicDigest in Pleasanton by Specialty Sales for $46990.